Tampa Bay this is an attraction you don&apos;t want to miss!!! Experience life-like dinosaurs at DinoQuest 2 at Tampa’s Lowry Park Zoo now through May 28! Discover the exhibit of 22 life-sized and animatronic creatures from Tyrannosaurus rex to Stegosaurus. See the dinosaurs move, blink and roar, and gather fun Dino facts, practice paleontology at the "I Dig It" fossil site, get a chance to move the mechanical T-rex, and speed down the Velocity-Raptor slide. These Dinos look so real, it really is a MUST see experience! Guests can also experience the creatures and some of the park rides in the dark at DinoNites from 6:30 p.m.-9:30 p.m. on select dates. Tickets to DinoQuest 2 are $4 per person, plus Zoo admission. Courtyard Marriot Tampa Downtown: Just 5.6 miles from the Zoo, the Courtyard Marriot is centrally located in downtown Tampa. The special DinoQuest package includes a one-night stay for two adults and two children, $20 Bistro Bucks, four DinoQuest 2 and Zoo tickets, and a free gift for young explorers. Mainsail Suites: Less than 15 minutes away from the Zoo, Mainsail Suites features full kitchens and living rooms. Package includes one and two-bedroom suites with tickets to DinoQuest or DinoNites, breakfast, and a souvenier. 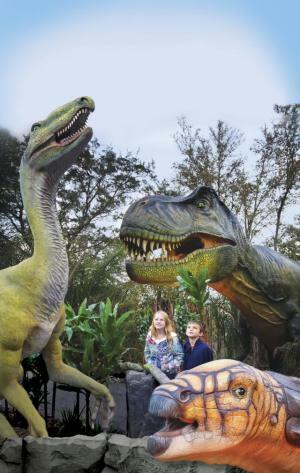 Intercontinental Tampa: In Tampa’s Westshore District, the DinoQuest package includes tickets for two adults and two children to the Zoo and DinoQuest exhibit, along with a keepsake stuffed animal. Other nearby hotels: Crowne Plaza Tampa Westshore, Hilton Garden Inn Ybor City, Renaissance Tampa International Plaza Hotel, and Sheraton Tampa Riverwalk.